SpongeBob finally applies for a job at the Krusty Krab. // SpongeBob finds the perfect use for his high powered reef blower. // SpongeBob meets Sandy Cheeks for the first time. SpongeBob introduces his unique talent of bubble blowing. // When SpongeBob tries to impress Sandy Cheeks at Mussel Beach, he ends up ripping his pants. While Squidward recovers from a bicycle accident, SpongeBob and Patrick takes him jellyfishing. // SpongeBob falls victim to a scheme by the evil Plankton. Squidward plays a joke on SpongeBob and Patrick, but the joke backfires on Squidward. // It's exam time again at Mrs. Puff's Boating School. Mr. Krabs has SpongeBob and Squidward make the first successful pizza delivery. // SpongeBob is losing his pineapple house to parasites. Watching reruns of Mermaid Man & Barnacle Boy. // SpongeBob loses his self-confidence when an arrogant customer claims SpongeBob forgot to put pickles on his Krabby Patty. Mrs. Puff's Boating School picks SpongeBob as this weeks Hall Monitor. // Over the repeated warning of his friends, SpongeBob takes a wild jellyfish home. Sandy has taken on the enviable mission of taking a rocket ship into outer space. // Mr. Krabs surreptitiously gives SpongeBob a pair of squeaky boots in lieu of pay. SpongeBob decides to leave his industrialized life and live off the land with the jellyfish. // Fed up with SpongeBob and Patrick, Squidward decides to sell his house. There's a talent show at the Krusty Krab and Squidward takes over the planning. // The evil Plankton tries to steal a Krusty Krabs' Krabby Patty. SpongeBob gets pumped up with the aid of inflatable muscles. // Squidward's accidental pasting by a flying shell haunts SpongeBob and Patrick. When Mr. Krab's daughter Pearl is stood up, SpongeBob agrees to step in. // Mr. Krabs dupes SpongeBob into believing he might break his winning streak and lose to Squidward. It's Halloween and SpongeBob is the easiest to scare in Bikini Bottom. // Squidward reluctantly agrees to take care of SpongeBob's pet snail, Gary. Fleeing from SpongeBob and Patrick's consistent noise, Squidward winds up frozen. // SpongeBob and Sandy's incessant Karate sparring is starting to wreak havoc in the Krusty Krab. 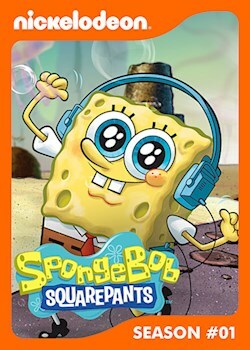 SpongeBob suddenly posses the ability to visit the dreams of his friends. // SpongeBob comes down with a case of the Suds, an illness which turns him into a bubble-maker. Patrick feels snubbed when SpongeBob's Valentine's Day gift doesn't arrive as planned. // SpongeBob turns Squidward's old gum wrapper into a magical toy. A pretend search for gold turns into a real treasure hunt. // SpongeBob gets on the wrong bus and finds himself lost in a mysterious part of the sea. Sandy is homesick and plans to return home. // The evil Plankton is up to no good once again when he tries to manipulate SpongeBob. Squidward decides to teach SpongeBob a REAL April Fool's Day prank, but finds out being mean doesn't necessarily mean funny. // SpongeBob seizes the mythical spatula of King Neptune. Mr. Krabs warns SpongeBob and Patrick to beware the dangerous fishing hooks! // SpongeBob joins Mermaid Man and Barnacle Boy on patrol..